Join us for a fabulous evening with a very Special Guest! 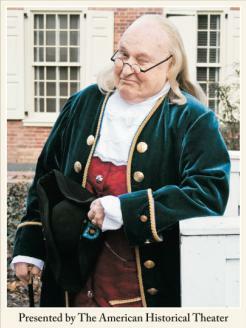 Spend an evening learning little known facts about one of America’s most popular historic characters, portrayed by Dean Bennett, one of the area’s best Ben Franklin impersonators. This event will be held Wednesday, September 14th, 2011 from 7:30 to 9:00 pm at the Athertyn Clubhouse, 7700 Parkview Drive, Haverford, PA. Those interested in attending this event can R.S.V.P. to Carrie Sullivan at 610-647-4700 or send an email to info@athertyn.com to reserve seats. Meet the Writer, Producer and Director of “The Mighty Macs” the inspirational new film based on the improbable true story of tiny Immaculata College’s 1972 national women’s basketball championship. This event will be held Thursday October, 6 2011 at the Athertyn Clubhouse.